So many people have been posting photos of themselves and/or friends and family, so I’m doing likewise. In October I went to a Getaway of folkies. The facilities were primitive, but we didn’t care. 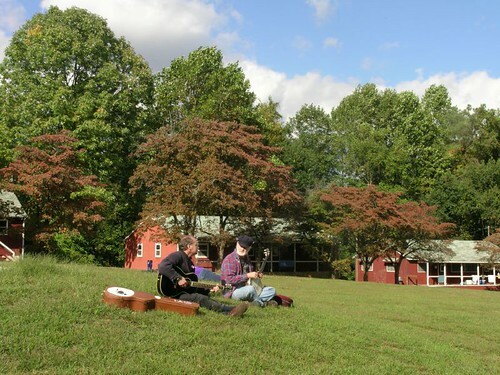 We just spent three days singing and playing folk music and hanging out with friends old and new. I, for one, got very little sleep, but I felt great. Here are a few of my many photos. Sometimes I’m surprised at how mean, selfish, and narrow-minded people can be. Sometimes I’m surprised at how nice people can be. Today I’m in the latter state of mind, and I want to write about it so that I can read it some time when I’m in a negative thinking mode. I recently switched my ISP, and now I have to put my web pages on my free webspace from my new ISP, Verizon.net. This has turned out to be very difficult because Verizon has gone to great lengths to make things easy. Grrrrrrrr. With my previous ISP, I could write my code in a free HTML editor and upload it to my webspace with a free FTP program. Verizon uses templates, and I’ve been trying to figure out what was in the minds of the designers and how I can get around it. Verizon has an option that allows you to upload your HTML code via an FTP program, but I couldn’t get it to work. I used their templates and followed their directions for using meta terms to make webpages searchable on Google. It did not work. I tried making two subaccounts to play around with, and that just made things worse. Nobody, including me, is going to look at pages entitled re? ?4 or vzq???. I needed to learn how to make the Verizon method work or find a reliable, cheap website host. I posted a request for advice on another Internet forum where I hang out, and someone came to my rescue. This was not an easy task because I had made such a horrible mess of things. She was very knowledgeable and so, so patient. We had several conversations by email, and then we scheduled and made phone calls to each other. I gave her my user name and password so that she could get into my account and see what was going on. After about a week of consultations with her, I finally figured out how to do it. I’m working on my website now, and when I get a reasonable amount done, I’ll give you the links. I’d like you to look at my website and give me feedback. The woman who rescued me is someone I’ve never met. In fact, I hadn’t even corresponded with her on the Internet. She is just a very kind and patient person. I really appreciate her help, and I’ve told her so many times. One of my students is a physical therapist. We often talk about the similarities between giving physical therapy and teaching violin. For both, you have to learn new motor skills which feel strange at first. After you repeat them many times, you develop muscle memory. You don’t have to watch yourself while you play because you develop proprioception. She told me that most of her patients come for therapy regularly and practice hard. She respects them and tells them so. I told her that they are such good patients, in part, because of the positive feedback she gives them. She is really a nice person, and she loves to help people. I teach two of my adult students together. This arrangement is working well, partly because they are good friends. I don’t see any upstaging or ego battles between them. Last week, student #1 told me that student #2 was sick and student #1 would come for a lesson alone. When they arrived for their lesson this week, I told student #2 that I hoped that she was feeling better. She looked confused, and student #1 told her that he had told me that she was sick. Student #2 then told me what the real problem was. She had had a setback in another area of her life, and she was feeling too bummed to come for a lesson. Student #1 was keeping student #2’s personal problem confidential. I thought that was very sensitive and kind. I complain about some of the strange men I’ve met in my adventures in dating. Recently I had a good experience. No, he is not the man of my dreams. However, he is a very nice person, and there are several other things about him that I like. Unfortunately, we don’t have enough in common for a romance, but I have good feelings about him, and I’d like to stay in touch with him as friends. I sent him an email telling him this and wishing him a good Thanksgiving holiday. He wrote a very kind email to me in return. He helps to maintain my faith in people and to give me hope that there is a good man waiting for me somewhere. Many times, I have been surprised and pleased with the comments and emails I’ve received from people on violinist.com. It’s good to know that people care, especially people who’ve never met me but still feel connected with me somehow. I know that I tend to feel more kindly towards the world when I’ve had enough sleep, enough food, and enough exercise. Good night, everyone. reads as if it were written by and for musicians because it includes extensive remarks by other musicians about Marsalis. Wynton Marsalis was born into a musical family in New Orleans in 1961. His father was a jazz musician and teacher, and his brother Branton became a musician, too. Wynton adopted a lot of his parents’ values. His father, Ellis, used to say that talent is a big lie. “When hard work meets opportunity, that’s when you get some degree of success…There are people walking around who don’t even know they have musical talent. Talent is mistaken for the thing that it takes for people to achieve exterior success.” I agree. For people who want to be professional musicians, talent is just the start. Aspiring musicians must have the right teachers, play and win the right competitions, win the favor of established musicians to serve as mentors, and have some very good luck. It’s not surprising that Ellis didn’t judge people by their “exterior success.” He didn’t treated people who were rich and successful any differently from other people. Wynton’s mother and father had an interesting view of success and failure. They didn’t think their kids were failures if they didn’t make the honor roll at school. They told their kids that they would be failures only if they didn’t do the best they could do. “It didn’t matter if you got a C as long as that was the best you could do,” said Wynton’s brother Branford, who got an F in high school biology even though he studied biology for two hours every day. His mother told him not to worry about it. She said that he could take the course again in summer school and get it over with. If he had gotten an F in music, she told him, she would kick his ***. In his student years, Wynton focused on classical music, and he became very accomplished at a young age. When he was seventeen, he auditioned for admission and a scholarship to the Tanglewood Music Festival. One of his audition pieces was Bach’s Brandenburg Concert No. 2, a killer for trumpeters. Trumpeters have been known to pass out while playing this piece because of the extreme demands it puts on their breathing. Nobody had ever dared use this as an audition piece for Tanglewood, but Wynton did. He played it flawlessly and was admitted to Tanglewood with a scholarship. He subsequently auditioned at Julliard, and he was admitted and awarded a four year scholarship there. He didn’t finish schoolat Julliard, though. When he was just 20, he was signed on by Columbia Records, who paid for recordings and publicity for him and his own five member band. Today Wynton Marsalis is a star trumpeter in both jazz and classical music, and he draws criticism from both groups. Some classical musicians say that his technique is sloppy because he plays jazz, and some jazz musicians say that his playing is cold and intellectual because he plays classical music. Wynton has a strong sense of history and respect for jazz musicians who preceded him and paved the way. He has not followed trends, such as electronic music, in his playing and composing, and he has been criticized by some jazz musicians for being too conservative and derivative in his music. Like Hilary Hahn, Wynton Marsalis is very dedicated to teaching kids. When on tour, he often goes into music classes in school to help educate the kids about music, sometimes without giving the teachers prior notice. Years ago, I saw a PBS TV special about him, and I was tremendously impressed with a sequence of him teaching some kids in a classroom in Washington DC. He had great rapport with the kids. He listened to a boy playing something on the piano. The boy’s playing was technically very good but lacking in emotional expression. When Wynton spoke to the boy, he said nothing about technical matters such as tempo and dynamics. Instead, he told the boy to imagine a beautiful, strong, spirited horse prancing and pawing the ground. Wynton painted such a vivid description verbally that I was reminded of a similar speech in the beginning of Shakespeare’s Henry V. The boy’s face lit up with a smile as he listened. Wynton told him to play the piece again, this time imagining the horse. The boy played the piece totally differently this time. He made music and it was exciting. I was very impressed with the power of this approach, and I use it on my own students. This TV show inspired me to do some reading and try to learn about jazz. Even though jazz is largely improvisational, it has a very complex structure. I still can’t understand it very well. After all, I was trained as a classical musician. Wynton has made a series of TV shows in which he teaches kids of all ages about jazz, just as Leonard Bernstein did with classical music decades ago. I’d love to see these shows, and I may well do that with the assistance of Amazon.com. I believe in the seamless garment theory of music. In its many genres, music speaks to what is true and universal within people. I am indebted to many great musicians and teachers of music, including Wynton Marsalis. Telling us go out and buy. Cocktail Carousel. A contraption from which you can hang six different liquor bottles in the inverted position. It “dispenses 1.5 ounce shot at a time.” It looks like something I’ve seen at 7-11 (convenience store) which contains fake liqueurs to put in your coffee. For only $29.99, you can make your kitchen counter look like part of a counter at the 7-11. Nuts-Nuts-Nuts. “Hospitality defined…the kinds you seldom see in shops…Giant whole cashews, Southern Pecans and California Almonds.” One lb. of nuts for $24.95. Of course you seldom see these nuts at these prices in shops. Who would pay that much for one lb of nuts? When my grocery store has a sale, I can get a one lb jar of roasted peanuts for $0.99. Kid’s Accordion. “Everyone loves the sound of an accordion.” If that’s true, why are there so many jokes about accordions and people who play them? “This high-quality instrument produces an authentic sound…” As opposed to a fake sound? At $19.95, it’s the perfect gift for children whose parents you hate. Russian Imperial Wreath Earrings. “…based on the wreath adornment from the top of a crystal clock made by the workshop of Peter Carl Faberge.” These earrings are 7/8” long and have 24K gold plate and 14K gold posts. At $70, these are not for people like me who keep losing earrings. Chrysanthemum Cutwork Scarf. This scarf has “an intricate and unusual laser-cut design, adapted from a 19th-century Japanese paper stencil. Polyester….70” x 11”. $95.” Although I’m intrigued by the juxtaposition of old and new art forms, I feel that if I pay $95 for a scarf, it should be made of silk, fine wool, or a bullet-proof material. Tower of Chocolates Collection. “We fill four fancy gift boxes with four of the world’s greatest chocolates – crafted by our in-house chocolatiers, luxuriously gift-boxed as shown, stacked and tied with a gifty holiday ribbon and bow. Includes our smooth Milk Chocolate Truffles, sophisticated Bing Cherry Chocolates, cool Chocolate Mints and incredible Dark Chocolate Moose Munch popcorn.” 1 lb 11 oz for $34.95. Now this is serious. If anyone wants to buy me something for Christmas, this is it! I’ve spent too many years of my life as a pauper, reduced to eating Hershey bars. For years, I’ve felt bad about the annual Christmas gift giving ritual. Gifts are often exchanged between middle class people who can afford everything they really need and some of the things they’d just like. Some of us struggle with trying to dream up something new and different to buy for each other year after year. We struggle to find gifts that we can afford, too. There are so many people who are really in need in the US, the richest nation on earth. Many people who lived in the path of Hurricane Katrina are now homeless. About one quarter of the population here has no health insurance. The budget of the National Endowment for the Arts is steadily being reduced, and some politicians keep trying to eliminate its funding altogether. These are not theoretical considerations for me. I have a friend whose family in New Orleans lost their home and most of their possessions in the hurricane. I have been, and probably will be again, without health insurance. My prescription drugs cost over $1000 a month. I buy pizza and candy from schoolchildren who are raising money for their schools to buy textbooks. I see homeless people sleeping on grates in winter. This year I’m going to do something I have wanted to do for years: alternate giving. Instead of buying gifts for my friends, I will make donations to charity. Some churches and other organizations have alternate giving fairs, and I went to one last year. People from various charitable organizations were there, and we consumers shopped around and decided who to give money to. I contributed some money towards the purchase of an asthma inhaler. One month’s supply of one kind costs about $175. I know because I use three different kinds. One of my students, an 11 year old boy who is talented and smart, enjoys playing the violin, even when the piece is challenging. At his last lesson, he remarked that one of the pieces he is studying is challenging because it has so many parts, and each part sounds almost like a different piece. I told him, “If you think that is difficult, listen to something by the Beatles.” He asked who the Beatles are, and his father replied that they were a rock group popular in the 60s. I started playing “If I Fell” and showed him the score with intro, two different parts of verse, the bridge part, the coda, and lots of changes in accidentals. I played some more of it, and he said, “That doesn’t sound like rock music. Rock music just has a lot of rhythm.” He was right. The Beatles’ music is so much better than almost all rock music, and different, too. The Beatles songs have great melodies, great harmonies, great rhythms, and great words. With all those facets to these songs, one might think that they just wouldn’t sound right when played by solo violin, but they sound great. They are pure music. About a year ago, I bought “The Concise Beatles Complete,” and I’ve practically worn the book thin already. Certain songs, especially, give voice to my feelings in a way that would not have been possible when I was a teenager. I find myself playing “If I Fell” whenever I meet an appealing man and start, or hope to start, on a dating relationship with him. Just now that song called to me. In about an hour, Thanksgiving will start. I have friends to be with on this holiday, but not anyone I love and feel close to. Like many people, I feel alone and scared during the holiday season. The Fab Four expressed it so well. That you will love me more than her. Will cry when she learns we are two. I've had a migraine for the last two days. I can barely verbalize, so I'll communicate with a picture. ‘Tis the season. Actually, according to merchandisers, the Christmas season began over a month ago. I think that advertising has been even more aggressive than usual this year. I always get lots of unsolicited Christmas catalogs in my mailbox, but this year I’m getting more than ever. The ads on the Internet are really driving me nuts. In spite of my anti-pop-up software, anti-ad software, anti-virus software, and frequent deletion of temp files, I am constantly being bombarded with ads. Often they appear several layers at a time. Sometimes the ‘close’ window is hard to find, or I have to click in the middle of the ad before I click on the ‘x’ in the corner of the ad. The ones that really offend me the most are the ones with audio – loud audio – which stay loud even though I have the volume on my speakers turned all the way down. I keep being told that I will get only targeted ads which will be chosen to appeal to me according to my Internet preferences and history. Why, then, do I get so many ads for casinos, gambling, Viagara and other drugs, and just about anything with pictures of buxom damsels in bikinis and the word ‘HOT’ in large font? How could anyone possibly think that these would appeal to me? My Internet history is misinterpreted in irresponsible ways. I recently finished a small paying job for which I read and wrote about off-label uses for prescription drugs. Now a lot of decision-makers in the ad business believe that I want to buy a lot of drugs. Even federal government agencies may be involved. I read that the Food and Drug Administration is considering monitoring inappropriate prescribing of drugs by watching the sites we click on. I have health insurance with a mail/Internet order pharmacy which keeps track of my prescriptions online. Then there are the telemarketers. I’m having more phone calls from them than I ever did before. I actually feel sorry for the people who make these phone calls. They just need some extra money, and they probably don’t like talking to me any more than I like listening to them. Lots of times I just don’t answer the phone. If someone I want to talk to leaves me a message on my answering machine, I call them back soon after I get their message. Oops, there goes my phone again. Do other people have similar experiences? Does anyone have any recommendations on ways to stop these assaults on my sensibilities? I heard Hilary Hahn in recital on Nov. 13, and she was absolutely, incredibly fantastic!! I heard her earlier this year, but I liked her most recent performance better because the pieces she played were beautiful and showcased her technical and artistic virtuosity. She played most of the pieces with her long-time musical partner, pianist Natalie Zhu. When I took my seat in the Kennedy Center Concert Hall, I looked around. As always, I had bought a relatively inexpensive ticket, so I sat in one of the balconies (Peasant’s Heaven). I noticed new acoustic shields placed high above the stage, where they deflect sound waves and make the music sound richer and warmer. I looked down at the orchestra level seats before most of the crowd arrived, and I remembered something I had read by Hilary Hahn on her website. She had written a list of exercises for “non-gym rats.” One of them was running up and down the aisles of a concert hall when there’s no one there to see you. I did not see her running. When she came on stage, I had a great view of her playing the violin. Her technique was flawless. She played the most difficult passages so smoothly that everything looked easy. The audience was spellbound during the whole performance. I sensed that everyone was sitting on the edge of their seats, focusing intensely, and, at times, holding our collective breaths. The first piece on the program was Ysaye’s Sonata No. 1 for Unaccompanied Violin. Her playing was sublime. Her tone was warm, rich, and sweet, bringing to my mind an image of honey flowing. Later in the piece, when she played in the lower registers, the image of Turkish coffee came into my mind. Sometimes, in my mind’s eye, I saw the dear man who was my childhood violin teacher, who loved to play this piece. The second movement was so beautiful that I didn’t want it to end. The Ysaye Sonata had a special connection for Hilary Hahn. For years, she had studied at the Curtis Institute with Jascha Brodsky, the last surviving student of Eugene Ysaye. Not only was her playing rich and sweet; it was dazzling in its technical virtuosity. The second piece was Enesco Sonata No. 3 in A Minor for violin and piano “On Popular Romanian Themes.” Enesco wrote this sonata in the style of wild gypsy music. She played it with stunning virtuoso pyrotechnics. It took my breath away. I had images of gypsies in long skirts dancing wildly as they circled a bonfire with the full moon shining through bare tree branches. I’ve heard people criticize her playing because it is not technically dazzling. Her performance of this piece shoots down that theory. Wow!! Playing this part of the concert was technically very demanding. All but stellar violinists would be exhausted by now. However, there was an intermission, and then more virtuoso playing of a different kind. The second half of the recital started with Nathan Milstein’s Paganiniana. I have heard several recordings of this by virtuoso violinists, but Hilary Hahn gave it new life. I was entranced. 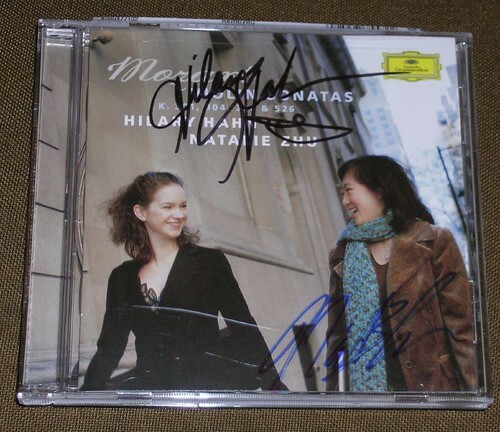 Then Hilary Hahn and Natalie Zhu playing Mozart’s Sonata for Piano and Violin in G Major, K. 301. This piece is featured in Hilary Hahn’s newest CD, and she discusses it in Listening Guides on her own website http://hilaryhahn.com/albums/mozart-sonatas.shtml and her webpage on Deutsche Grammophon’s site http://www.deutschegrammophon.com/home.htms?CONTENT=artist/one.htms?ART_ID=HAHHI. This sonata is not violin music with piano accompaniment. Rather, the piano and the violin are equally important. Mozart, after all, excelled in playing both piano and violin, although he is remembered more as a pianist. In the Listening Guides, Natalie Zhu talks about “trust…equality of us as musicians…partnership,” and Hilary Hahn emphasizes the partnership, too. These two musicians have been playing together for about 10 years, and they seem like girlfriends having fun together. The photo on the CD cover portrays them as musical friends, and I had the same impression when I saw them. As they walked on and off stage, I could sometimes see Hilary Hahn tilt her head towards Natalie Zhu as she smiled and said a few words. 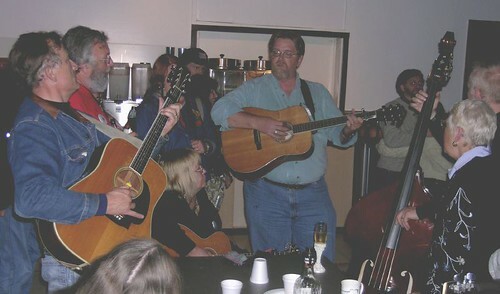 They seemed comfortable together, like old friends, but their playing was fresh and exciting. This sonata is very “Mozart,” giving the sense of sweetness, smoothness, comfort, and order as in a child’s world. This piece did not have pyrotechnics, but it was very impressive in other ways. As Hilary Hahn said in one of her Listening Guides, the music is “delicate...[but not fragile …and it] requires finesse.” They certainly played it with finesse. The last piece on the program was Beethoven’s Sonata in E Flat Major, and it was another tour de force. This sonata is very “Beethoven,” full of drama and intensity. As in the Mozart sonata, both the violin and the piano are important, and there is a lot of dialogue between the two instruments. However, the Beethoven sonata, unlike the Mozart sonata, is keyboard-driven. The audience applause was tumultuous, and the musicians played two encores. Both were virtuoso show-off pieces arranged and played by legendary violinists: Heifetz’s arrangement of March from Prokofiev’s Love for Three Oranges and Kreisler’s arrangement of Tango by Albeniz. These are both really fun to listen to, and the audience was enraptured. I especially liked the Tango. Hilary Hahn’s artistry was dazzling, especially when she played softly. We were all spellbound. The ending was dazzling, like intricately spun glass. Overall, Hilary Hahn’s playing was warm, full, rich, resonant, and always of high clarity. Her range of expression was impressive, and so was her virtuoso technique, whether fiery or subtle. Now I have Hilary Hahn’s autographs for souvenirs, but, more important, I have heard her stunning artistry and her conversation with a six year old who has a birthday in November. Tomorrow night I am going to hear Hilary Hahn at the Kennedy Center. She will play sonatas by Mozart and Beethoven with her piano accompanist Natalie Zhu. I checked her website, which is wonderful in many ways, to prepare myself, and I’m so glad I did. She has a new recording of Mozart sonatas on DG, and her website has sound clips of the sonatas and her spoken Listening Guide to the recording. She is a wonderful teacher, and she has focused on outreach and teaching to children because she was a child prodigy. 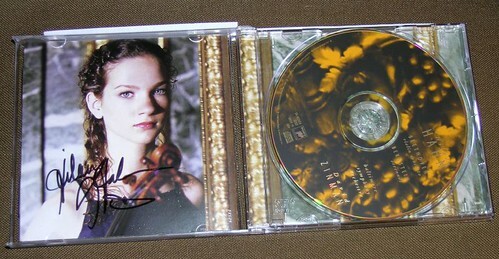 I’m listening to her now, and you can, too, at http://hilaryhahn.com/albums/mozart-sonatas.shtml . I will write about her concert after I hear it. I learn a lot about myself by the photos I take, as well as by the music I play. I am fascinated with gates, especially open gates. I’ve been photographing them for years. Sometimes I walk over to a closed gate and open it, providing that there are no dogs or cows that might get out. Then I walk away, photograph the open gate, return, and close it. A gate is an invitation to explore. 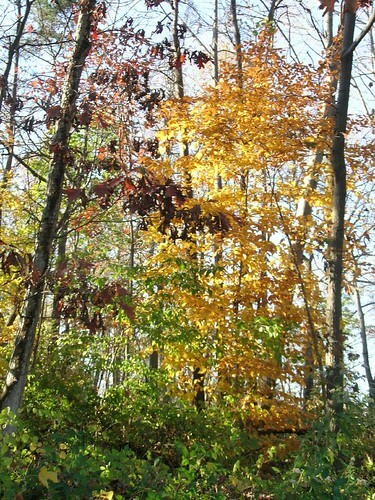 The woods in autumn also beckon to me with the promise of newness. 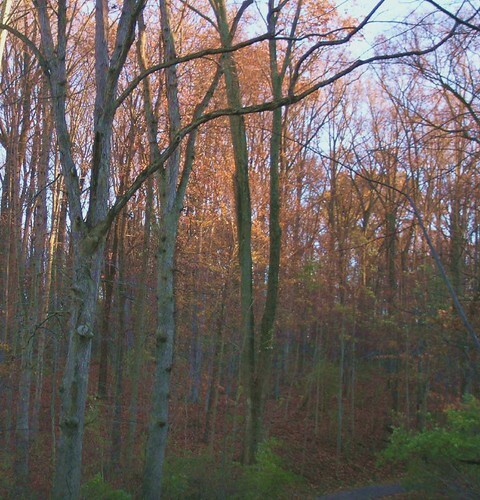 As the leaves turn bright colors and fall to the ground, the scene changes and reveals what was there earlier, though hidden from us. Our vistas are always being renewed. We need only be open to them and be ready to explore. 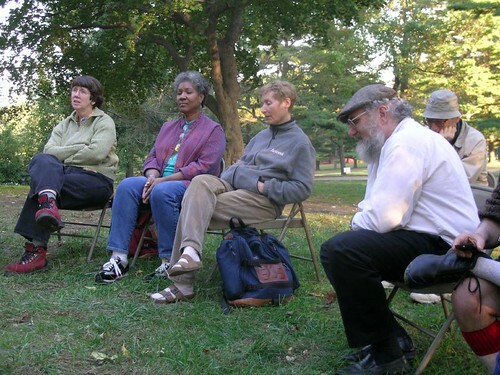 There is a discussion on music teaching on another Internet forum where I hang out. Someone wrote something that is so good and expresses my feelings so beautifully that I am copying it here, with her permission. It's been the only job where I can sleep at night knowing I've done some good for folks every day. Yes, there are few things more rewarding than watching eyes light up with the realization "Wow ...I CAN do this after all! I must be more intelligent/ smarter/talented/creative than I thought! I sound so good! 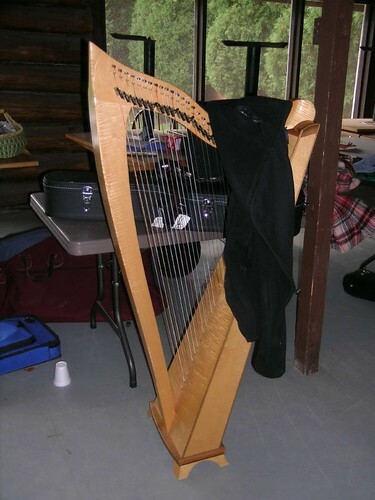 And it's so much fun ..."
Or to have the honour of being asked to play for your former student's wedding(s), "because it would mean so much to the whole family to have you here." Remember? The one(s) you struggled so patiently with week after week from age 6, till she finished her Grade 9 was off to university - and now teaches students of her own. I understand more now about what happened during my latest disaster in love. Getting comment from my friends on v.com helped me understand. I am not a religious person, although I’m very spiritual. Now I’m asking people to pray for me and for him.